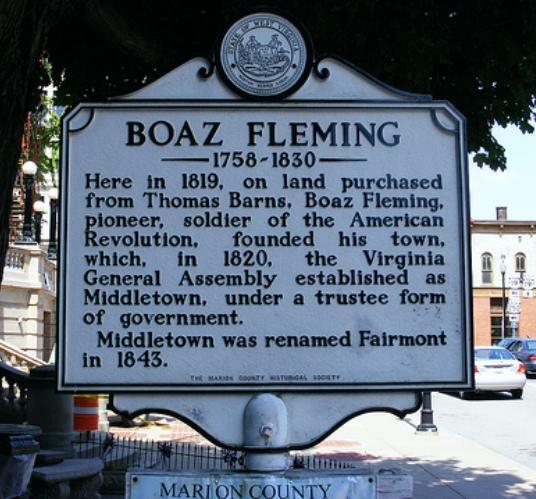 Oral history indicates that in 1808 Boaz Fleming made his annual trek to Clarksburg to pay his brother's Harrison County taxes. While in Clarksburg he attended a social gathering that included Dolly Madison, his cousin. He complained to her about having to travel over a hundred miles each year from his home to pay his Monongalia County taxes and his brother's Harrison County taxes. Dolly Madison supposedly suggested that he create his own county to save him all that travel. Six years later, Boaz Fleming circulated a petition to do precisely that, naming the proposed county Madison County, in honor of Dolly and President James Madison. The petition failed to gain sufficient support to be presented to the Virginia General Assembly. He then focused on creating a town near his farm. In 1819, a road was built from Clarksburg to Morgantown. His farm was about halfway between the two, making a good resting point. He laid out the town on the west side of the Monongahela River in 1819. It was incorporated on January 19, 1820 as Middletown. It is unknown if the town was called Middletown because of its location mid-way between Clarksburg and Morgantown or because Boaz Fleming's first wife, Elizabeth Hutchinson, was originally from Middletown, Delaware. Middletown was named newly-formed Marion County's first county seat on February 18, 1842. At that time, William Haymond, Jr. suggested that the town's name be changed to Fairmont because the town had a beautiful overlook of the Monongahela River, giving it a "fair mount." The Borough of Fairmont was incorporated in 1843 by the Virginia General Assembly. He was a veteran of the Revolutionary War. Serving in the 2nd Delaware Regiment. Boaz and Elizabeth had ten children... Clarissa, William, Mary, Elizabeth, David Graham, Sarah, Lemuel, Jane, Joannah, and Margaret. 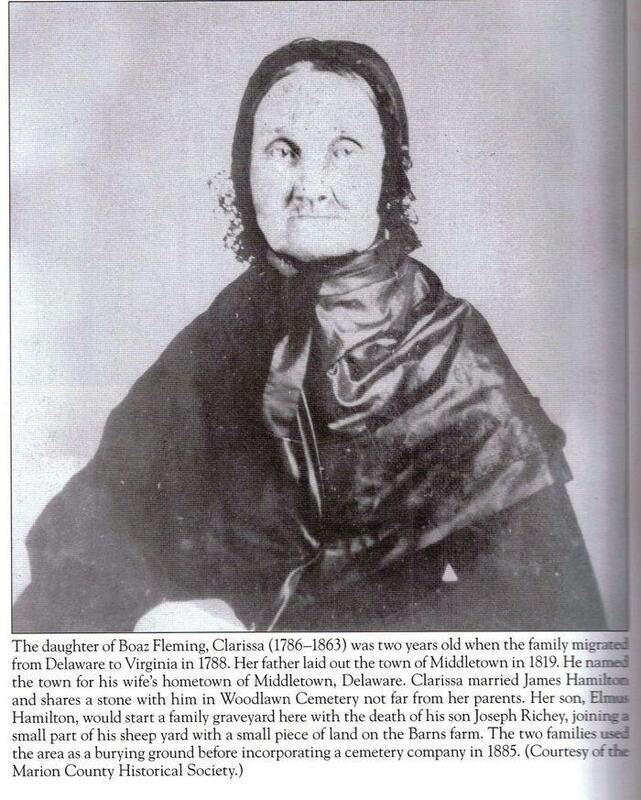 Clarissa Fleming (born in 1786) married James Hamilton (born 1783, son of Henry Hamilton and Elizabeth Fry). They had six children, Boaz Fleming, Henry Fielding, Elizabeth, Mary Ann, Elmus, and Christina Jane.